Abstract: Extant neuroimaging data implicate frontoparietal and medial-temporal lobe regions in episodic retrieval, and the specific pattern of activity within and across these regions is diagnostic of an individual’s subjective mnemonic experience. For example, in laboratory-based paradigms, memories for recently encoded faces can be accurately decoded from single-trial fMRI patterns. Goal-directed modulation of neural memory patterns: Implications for fMRI-based memory detection. Detecting individual memories through the neural decoding of memory states and past experience. Here, we investigated the neural patterns underlying memory for real-world autobiographical events, probed at 1- to 3-week retention intervals as well as whether distinct patterns are associated with different subjective memory states. For 3 weeks, participants ( n = 16) wore digital cameras that captured photographs of their daily activities. One week later, they were scanned while making memory judgments about sequences of photos depicting events from their own lives or events captured by the cameras of others. Whole-brain multivoxel pattern analysis achieved near-perfect accuracy at distinguishing correctly recognized events from correctly rejected novel events, and decoding performance did not significantly vary with retention interval. Multivoxel pattern analysis classifiers also differentiated recollection from familiarity and reliably decoded the subjective strength of recollection, of familiarity, or of novelty. Classification-based brain maps revealed dissociable neural signatures of these mnemonic states, with activity patterns in hippocampus, medial pFC, and ventral parietal cortex being particularly diagnostic of recollection. Finally, a classifier trained on previously acquired laboratory-based memory data achieved reliable decoding of autobiographical memory states. We discuss the implications for neuroscientific accounts of episodic retrieval and comment on the potential forensic use of fMRI for probing experiential knowledge. The concept of thinking with space may seem as ubiquitously obvious as the answer to the question posed by David Foster Wallace’s (2009) fictional fish: “what is water”? For, how would it be possible to do anything without space? Of course we think with space; we exist in space, neurons take up space, and all we see relies on an underlying spatial framework. However, not everything we think about is overtly spatial. For instance, I need not account for space when preparing my outfit for the day nor when calculating a budget for food expenses next month. Nonetheless, the conceptualization of space is arguably the most fundamental cognitive procedure our brains participate in. The life cycle of a clabelina moluccensis, more commonly referred to as the bluebell tunicate or blue sea squirt, is perhaps the most literal encapsulation of this proposition; the bluebell tunicate begins to digest its cerebral ganglion once identifying a suitable undersea perch to spend the rest of its existence, reverting to the more primitive, sessile adult form of the species (Linas, 2001). The nutrients provided to the organism by digesting its nervous system is more valuable in regards to its prolonged existence than the retention of an advanced neural framework. Both Dennett (1993) and Linas (2001) took this evidence to suppose that a brain is necessary only for actively moving creatures. I will argue hereafter that since a representation of space is a prerequisite for an organism’s ability to move (perhaps the most potent evolutionary prowess) that the brain’s spatial processing framework is it’s most powerful feature. Seeing as navigation about a spatial environment was the first concern of organisms, it has had the “head-start” of greatest breadth when compared to any and all other aspects of cognition. I will provide examples which illustrate that this categorical advantage has warranted the brain’s recycling of cognitive systems supporting spatial representation for the utility of non-spatial processing. It is this reutilization that I refer to when using the phrase thinking with space. By expanding beyond the boundaries of its initial goal-states, the brain’s spatial processing framework has afforded temporal, lingual, logical, and mnemonic systems with an advanced toolkit for achieving their more advanced organism-specific evolutionary contributions. The advent of calendars, dating back to Near-East civilizations over four thousand years ago (Brittanica –Babylonian Calendars, 2015), marks the first time that intelligent creatures conceptualized time within a spatial construct. Calendars allow, to this day, one to explicitly visualize time in an organized fashion. Ancient astronomers lacked the ability to see the moon rotate the Earth, or the Earth move around the sun. However, they could note the temporal periodicity of the moon’s appearance in the sky and transform this temporal representation into a spatial one that treated each day as a unit with units to the left and right of it indicating previous and subsequent days, respectively. Such a transformation allowed for ancient civilizations to achieve initial insights as to the definite recurrence of these temporal patterns. In so doing, they were able to reliably plan for cosmic events that aided in agriculture. For example, the Egyptian civilization used calendars to calculate agricultural seasons around the flooding of the Nile – Akhet, the season of the inundation (Kemp, 2006). By transforming a temporal phenomenon into a spatial dimension by way of a formal calendar system, ancient civilizations were able to recruit their evolved neural systems for spatial processing so as to conceptualize a previously intangible reality. The consequences of such an understanding allowed for a greater guaranteed chance of nutrition for the culture, which, ultimately led to longer lives and healthier offspring capable of fostering more advanced brains in the future. Furthermore, the opportunities afforded by the civic adoption of the calendar are ubiquitous. By having a calendar at one’s fingertips, anyone can strategize in a coordinated fashion so as to organize for advanced sociological proceedings in a collaborative fashion. Such initially organized events like market fairs, town forums, and ovulation cycles led to the temporally coordinated modern events like music festivals, invasions, vote-days, and rocket launches. It’s difficult to imagine such modern civic feats of synchronicity without the ability to coordinate across persons with a calendar – an invention that stemmed from expanding our spatial capabilities beyond their initial domain. It would be a mistake, however, to suppose that cognition consists simply of building maximally accurate representations of input information…the gaining of knowledge is a stepping-stone to achieving the more immediate goal of guiding behavior in response to the system’s changing surroundings. Thus, a framework that was used to represent one’s situatedness in an environment has once again been recruited so as to enhance a separate cognitive domain—language. Gesticulation by way of hand movements has been repeatedly demonstrated to facilitate understanding by way of conveying concepts in a fashion that superposes and extends verbal restraints. Sign language is an explicit example of how the observation of motion can drive thought transfer in an isolated fashion. By creating motion within the domain that recruits our spatial processing mechanisms (i.e. the space between a speaker and a listener) we create a kind of back-channel way of expressing and working out thoughts with optimized machinery. Cook et al. (2008) solidified this notion of spatially-enhanced-communication by way of research showing that college students who gestured as they retold short stories they’d seen recalled the details of the stories better, suggesting that gesturing as we’re remembering helps to bolster the hoped accomplishments of language. In the conclusions, Cook et al. (2008) go on to say, “gesturing can thus play a causal role in learning, perhaps by giving learners an alternative, embodied way of representing new ideas.” Broaders et al. (2007) provides additional evidence for the eased conveyance of concepts when an instructor utilizes embodied cognition alongside lingual explanations: third-graders who were asked to gesture while learning algebra were nearly three times more likely to remember what they’d learned than classmates who did not gesture. Thus, even language, one of the more integral components of human intelligence, takes a helping hand from the brain’s disposition to represent things within a spatial framework. If cognition is thought of as an ascending assimilation of information, then reasoning is certainly at its apex. Despite its neural prestige, even analogical reasoning and its associated areas of advanced abstraction, logic, and decision-making have witness benefit from reverse-projecting complex information from the high-dimensional feature space in which it resides into a tangible space realm—the one in which we have perceptual access to. Perhaps the most blatant exemplar of spatial processing recruitment to the domain of reasoning is in the use of spatial limits in illustrating logical possibilities. The notable amelioration of difficult logical problems by way of manipulating them within a spatial framework has its merit based in plausibility space. That is, as a thinker entertains the plausibility of an argument, he can construct a space for each premise to exist in. As subsequent premises are presented, the observer can note their dependence, independence, superposition, etc. with the previous premises. Subsequently, when a conclusion about such relations needs to be evaluated, the thinker can recruit his/her spatial processing framework to identify the spatial plausibility of such a conclusion and then translate that into terms of logical validity. 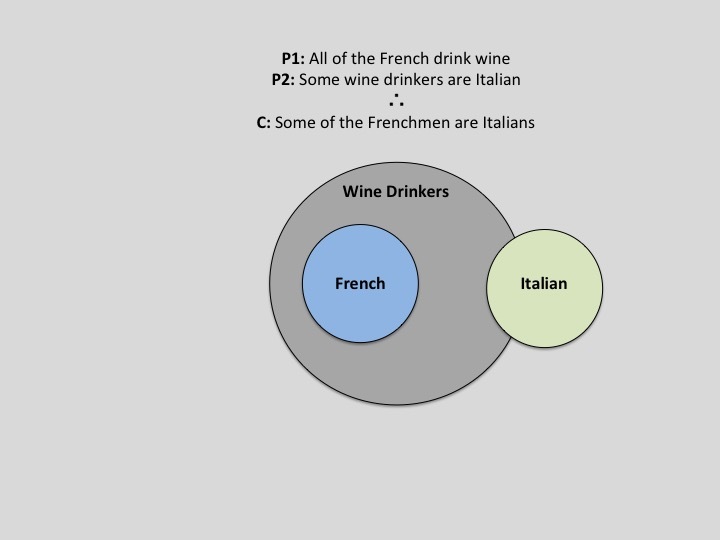 A simple Venn-Diagram accomplishes this concept in an exemplary fashion, as is demonstrated in Figure 1. While limited in its complexity, the Venn-Diagram serves as an introductory segue to using spatial infrastructures to tackle complex logical problems. A more advanced example would be “Tarski’s World”– a software supplement typically included in introductory courses focused on first-order logic (See Appendix A. for a visualization). 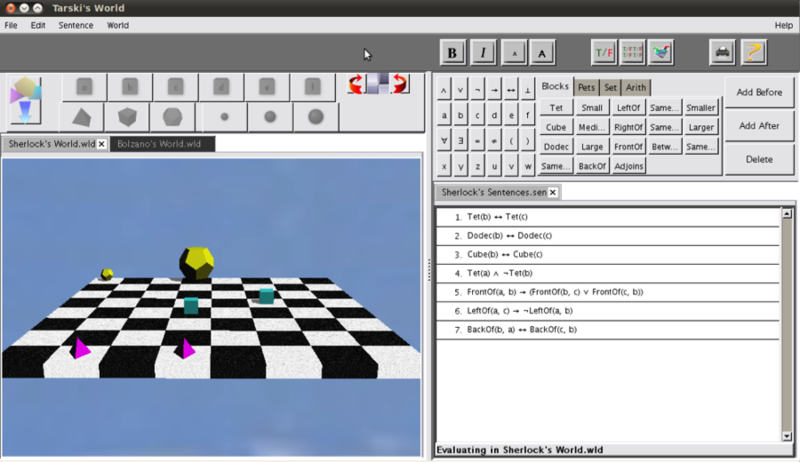 The Tarski’s World application allows the evaluation of first-order sentences within blocks world which users may construct using a simple editor. The worlds consist of collections of blocks of varying sizes and shapes, and placed on a checkerboard. We use an interpreted first-order language, which allows users to write sentences about these worlds and evaluate their truth. A Henkin-Hintikka game may be used to elucidate the evaluation procedure (Barwise, 2993). Such spatial processing within the reasoning domain seems almost fundamental to a thinker’s advanced success. While the cognitive science community has yet to reach a unanimous consensus on the rightful declaration of an individual’s domain-invariant reasoning abilities, dubbed fluid intelligence, many have put faith in the Raven’s Progressive Matrices (Raven, 1936; Raven, 2000) as a test for varying degrees of intelligence. Interestingly enough, Raven’s Progressive Matrices is entirely based on spatial reasoning—identifying a subsequent spatial pattern following a preceding evolution of spatial transformations. Perhaps it is the case that one’s ability to think within a spatial framework speaks directly to their ability to recruit this framework for non-spatial processes and reap its enhancement benefits. Such a scenario sees support from the observation that students who are explicitly exposed to spatial depictions of solutions to analogical problem solving puzzles are more likely to adapt that solution to future problems, especially if they are of higher intelligence (Kubricht, 2015). Perhaps the most documented across-domain cognitive relationship is between space and memory. Such a relationship has a deep and profound set of explanatory evidence from cognitive neuroscience. The hippocampal formation has long been associated with the encoding of both spatial environments and long-term episodic memories. Researchers have made remarkable progress towards understanding the mechanisms of these seemingly disparate processes. Concerning the encoding of spatial environments, the hippocampal formation has a variety of spatially specialized neurons: “place cells” have been shown to fire specifically at one or a few locations in an animal’s environment (for a review see (O’Keefe, 1979); a population of “border cells” in the entorhinal cortex encode a representation of geometric borders (Solstad et al., 2008); “grid cells” in the entorhinal cortex, which encode the entire expanse of a spatial location via a triangular coordinate system; “head-direction cells” in the postsubiculum discharge as a function of the animal’s head direction in the horizontal plane, independent of the animal’s behavior (Taube et al., 1990). Concerning the encoding of long term episodic memories, the hippocampal formation’s involvement in the establishment of new memories is a frequently observed phenomenon across all domains of neuroscience (Squire and Zola, 1996; Squire, 1992; Tulving and Markowitsch, 1998; Rissman and Wagner, 2012) . Degradation or removal of the hippocampus is strongly correlated with the inability to form new memories (Scoville and Milner, 1957). Additionally, individual differences in hippocampal integrity correlate with mnemonic function (Simoneit and Hites, 1997). A growing body of literature has attempted to ascribe a common cause as to why the hippocampal formation is important for both memory and space (Bird and Burgess, 2008; Eichenbaum et al., 1999). The medial pallium, whose allocortex forms the hippocampal formation, evolved alongside human navigation into novel terrain (Jacobs, 2003). Thereby, it should come as no surprise that the hippocampus is primarily a spatial mechanisms and that spatial memory is likely our strongest form of memory. Rudimentarily, both spatial and mnemonic representation in the hippocampus necessitates a network of interconnected representations. Both O’Keefe & Nadel’s spatial map theory (1978) and Eichenbaum & Cohen’s relational memory theory (2001) speak to this point. O’Keefe & Nadel posit that populations of place cells can become interconnected and provide an animal with a flexible, allocentric representation of space that, according to [Best and White, 1999]), can then be used for novel route planning. Similarly, Eichenbaum & Cohen proposed that abstract features of an episode (e.g objects, people, etc.) are individual nodes in a network, whose temporal linkage forms a collective representation of an event. This allows for the ability to re-instantiate the same network with the activation of some, but not necessarily all, nodes within it. Research into the existence of “concept cells” within the hippocampus (Quiroga, 2012) , which are sparsely activated by highly-specific domain-invariant (i.e presentation by picture, audio, or text elicits the same neuronal response) concepts (e.g Luke Skywalker), suggest a hierarchical mechanism that integrates overlapping mnemonic networks in the same way that both grid cells and sensory inputs create succinct place cells (Bush et al., 2014) . Thereby, it appears as though hippocampal circuitry is hierarchical in nature and such a framework is crucial for the encoding of both space and events: space is made up of a collection of “places”, and both events and concepts are made up of a collection of “features”. The interplay between space and memories is further emphasized by the observation that hippocampal representations of both space and concepts vary anatomically depending on the size of the representation. For example, there is a progressive increase in grid scale from dorsal to ventral medial entorhinal cortex (Brun et al., 2008), meaning that larger and larger grids are formed to overlay the special environment. Researchers have been actively attempting to parallel this anatomical discretization of space by examining the sub-regions of the hippocampus in relation to their role in the construction of either abstract versus detailed concepts/events. Primarily, it has been shown that the anterior hippocampal formation is concerned with the encoding of abstract concepts and memories while the posterior hippocampal formation is concerned with the encoding of more detailed forms of memory (Poppenk et al., 2013; Ranganath and Ritchey, 2012). As emphasized by Milivojevic and Doeller (2013), the study of the hippocampus’ role in both space and memory has been approached, thus far, in isolation. Subsequently, any theories that have attempted to pinpoint the underlying neural mechanisms that can support both processes are inherently post-hoc and potentially flawed. The aim of this current research is to elucidate the bridges that span the gaps between such hippocampal processes from an a priori perspective. In other words, we sought to unveil how the human hippocampus recruits a circuitry that initially evolved for the processing of spatial environments and use it for the memorization of non-spatial content. In so doing, we examine the ways in which space and memory become intertwined and can, through scientific operations, be dichotomized. Fantastically positioned at this junction of space and memory, lies the most widely used memory enhancement technique: The Method of Loci. The Method of Loci is first noticed in Marcus Cicero’s De Oratore (written in 55BCE – translated by A. S. Wilkins Clarendon in 1963). Cicero in his De Oratore shares the story of the poet Simonides of Ceos who was dining whilst sharing his poetry in Thessaly at a large banquet table. Halfway through his poem, Simonides was called for a message outside. During this time, the building collapsed with such destruction that it not only killed all the guests inside, but left their bodies unidentifiable. Simonides was left with the task of attempting to relay to the deceased’s relatives which body belonged with which name. Simonides was astounded by his ability to recall the locations where each of the guests (whom he had just met that night) had sat. He was subsequently able to parlay this information for the identification of the mangled bodies. As a poet in Ancient Greece, Simonides was previously enthralled with the art of memory; spellbinding oration for the presentation of poetry mandates an intimate acquaintance with the verse at hand. “Noting that it was through his memory of the places at which the guests had been sitting that he had been able to identify the bodies, he realized that orderly arrangement is essential for good memory” (Yates, 1966). Simonides went on to develop a mnemonic method that could bundle the benefits he observed that fateful day. Over 2000 years later, the instructions that Simonides solidified remain, fundamentally, the same. In order to implement the Method of Loci, one is typically instructed to conjure up a familiar structure (e.g., a childhood home) in their imagination that will serve as their “memory palace”. While mentally navigating through this environment, one can imagine “placing” a list of to-be-remembered items in different locations. When later attempting to retrieve this list of items, one simply has to navigate back through the environment and “observe” the objects in their previously placed locations. The efficacy of the Method of Loci in enhancing memory is a well-documented behavioral phenomenon (Ross and Lawrence, 1968; Crovitz 1971; Briggs 1971). Subjects often times witness a seven-fold increase in ordered retention (Bower, 1970). Its potential for increasing memory has been used by memory champions and educators to immense success (Foer, 2011). The incredible mnemonic effects witnessed by users of The Method of Loci should come as no surprise. Seeing as the hippocampus primarily evolved as a spatial machine (Jacobs, 2003), it would follow that it’s most impressive feat is that of spatial encoding. Thereby, it follows that the Method of Loci seems to work by exploiting the remarkable vividness of our visuospatial memories by using spatial environments as scaffolding for memorizing non-spatial content. In conclusion, thinking with space appears to be a practically omnipresent phenomenon throughout all of cognition. While the introduction to this text spoke to the literal impossibility of thinking without space, it appears as though the figurative definition is equally inseparable. Projecting problems into a spatial domain reliably facilitates the solving of that problem by taking advantage of the brain’s spatial processing system, which has an insurmountable temporal advantage of advancement due to its early adoption by organisms in order to accomplish the most basic tasks of survival. Such a postulate has observable neuroanatomical correlates (e.g. hippocampal evolution), a vast array of societal implications (e.g. calendars and analog watches aiding culture) and behavioral benefits (e.g. facilitating communication, reasoning, and bolstering memory strength). As the cognitive and educational sciences begin to incorporate explicit spatial learning aids (e.g. through the use of virtual reality) into research and instruction, it is reasonable to anticipate a revolutionary, all-encompassing enhancement of thought by way of a poetic recycling of the systems that allowed for thought in the first place. Researchers have since revealed evidence that the tunicate does indeed retain a commendable neural system. However, glial cells are absent and neuronal axons are unsheathed resulting in the functional equivalent of a peripheral nerve net, capable only of generating local activity and mediating simple reflexes (Mackie, 2005). Nonetheless, even in its most primitive form, the example of the sea squirt upholds the subsequent postulation in the above body text. In addition to calendars, it’s a small leap to recognize the ways in which the analog watch represents time as a sinusoidal harmonic oscillation in its phase-plane—spatial degrees around a circle. Such temporal precision has afforded even more precise instances of synchronicity than the calendar. In artificial intelligence and cognitive science, the term situated refers to an agent, which is embedded in an environment (Hendricks, 1996). Essentially, for one to be situated in an environment, one must have a sense of self and the space around them– thus making embodied cognition, by way of recruiting neural mechanisms necessary for situatedness, relies upon the brain’s spatial processing mechanisms. Barwise, Jon, and John Etchemendy. “The Language of First-Order Logic Including the Macintosh Version of Tarski’s World 4.0.” (1993). Broaders, Sara C., et al. “Making children gesture brings out implicit knowledge and leads to learning.” Journal of Experimental Psychology: General 136.4 (2007): 539. Brun, V., Solstad, T., Kjelstrup, K., Fyhn, M., Witter, M., Moser, E., and Moser, M.-B. (2008). Progressive increase in grid scale from dorsal to ventral medial entorhinal cortex. Hippocampus 18, 1200–12. Bush, D., Barry, C., and Burgess, N. (2014). What do grid cells contribute to place cell firing? Trends in Neurosciences 37. Cook, Susan Wagner, Zachary Mitchell, and Susan Goldin-Meadow. “Gesturing makes learning last.” Cognition 106.2 (2008): 1047-1058. Dennett, Daniel C. Consciousness explained. Penguin UK, 1993. Goldin-Meadow, Susan, and Susan M. Wagner. “How our hands help us learn.”Trends in cognitive sciences 9.5 (2005): 234-241. Hand Gestures Say A Lot About Your Intelligence (Business Insider)By: Paul, Annie. Hendriks-Jansen, Horst. Catching ourselves in the act: Situated activity, interactive emergence, evolution, and human thought. MIT Press, 1996. Johnson, Brian, and Ben Shneiderman. “Tree-maps: A space-filling approach to the visualization of hierarchical information structures.” Visualization, 1991. Visualization’91, Proceedings., IEEE Conference on. IEEE, 1991. Kemp, Barry J. Ancient Egypt: anatomy of a civilization. Psychology Press, 2006. Kubricht, James, Lu, Hongjing, Holyoak, Keith. In Press. “Animation Facilitates Source Understanding and Spontaneous Analogical Transfer”. Proceedings of the 37th Annual Conference of the Cognitive Science Society. Llinás, Rodolfo. “I of the Vortex. From Neurons to Self. 2001.” (2001). Mackie, G. O., and P. Burighel. “The nervous system in adult tunicates: current research directions.” Canadian journal of zoology 83.1 (2005): 151-183. Miłkowski, Marcin. Explaining the computational mind. Mit Press, 2013. O’Keefe, J. (1979). A review of the hippocampal place cells. Progress in Neurobiology 13, 419439. O’Keefe, J., & Nadel, L. (1978). The hippocampus as a cognitive map. Oxford, England: Oxford University Press. Poppenk, J., Evensmoen, H., Moscovitch, M., and Nadel, L. (2013). Long-axis specialization of the human hippocampus. Trends in cognitive sciences 17, 230–40. Quiroga, R. Q. (2012). Concept cells: the building blocks of declarative memory functions. Nature reviews. Neuroscience 13, 587–97. Ranganath, C., and Ritchey, M. (2012). Two cortical systems for memory-guided behaviour. Nature reviews. Neuroscience 13, 713–26. Raven, J. C. “Mental tests used in genetic studies: The performance of related individuals on tests mainly educative and mainly reproductive.” Unpublished master’s thesis, University of London (1936). Raven, John. “The Raven’s progressive matrices: change and stability over culture and time.” Cognitive psychology 41.1 (2000): 1-48. Rissman, J., and Wagner, A. (2012). Distributed representations in memory: insights from functional brain imaging. Annual review of psychology 63, 101–28. Rosch, Eleanor, Evan Thompson, and Francisco J. Varela. The embodied mind: Cognitive science and human experience. MIT press, 1992. Scoville, W., and Milner, B. (1957). LOSS OF RECENT MEMORY AFTER BILATERAL HIPPOCAMPAL LESIONS. Journal of Neurology, Neurosurgery & Psychiatry 20, 11–21. Shapiro, Lawrence, ed. The Routledge handbook of embodied cognition. Routledge, 2014. Solstad, T., Boccara, C., Kropff, E., Moser, M.-B., and Moser, E. (2008). Representation of Geometric Borders in the Entorhinal Cortex. Science 322, 1865–1868. Squire, L. R. (1992). Memory and the hippocampus: a synthesis from findings with rats, monkeys, and humans. Psychological review 99, 195–231. Squire, L. R., and Zola, S. M. (1996). Structure and function of declarative and nondeclarative memory systems. Proceedings of the National Academy of Sciences 93, 13515–13522. Taube, J. S., Muller, R. U., and Ranck, J. B. (1990). Head-direction cells recorded from the postsubiculum in freely moving rats. I. Description and quantitative analysis. The Journal of neuroscience : the official journal of the Society for Neuroscience 10, 420–35. Wallace, David Foster. This is water: Some thoughts, delivered on a significant occasion, about living a compassionate life. Hachette UK, 2009. Yates, Frances Amelia. The art of memory. Vol. 64. Random House, 1992. Reggente, N., Essoe, J.K., Jevtic, I., Rissman, J. Introduction: Navigating about one’s environment is a multi-faceted effort requiring a faithful representation of the visuospatial layout and one’s position and orientation within a space. Mental imagery is known to play a key role in successful navigation; whether planning out one’s own route or providing directions to others, we must mentally simulate a trajectory through space and conjure up representations of pertinent contextual details. In this fMRI study, we used a VR-based experimental paradigm to examine whether and how the neural representations of one’s environment and navigational trajectory change as a function of whether the navigation is perceived or imagined. Methods: Three unique virtual environments (VEs) were created so as to maximize the distinctiveness of each VE, while matching them for size and spatial distribution of major landmarks. Day 1(In Lab): Subjects were familiarized to the VEs by way of token collection tasks and guided navigation exercises that ensured even explorations of the VEs across subjects. Day 2(In Lab): Subjects were submitted to additional navigational exercises followed by a test of their allocentric memory of the VEs. Day 2(In Scanner): fMRI data were collected as subjects viewed a series of first-person video clips taken from each of the VEs that they explored on Day 1. Each 30 s video started from a specific landmark and provided a tour of the perimeter of the VE before ultimately returning back to the same landmark. For each starting landmark, two videos were presented to the subject: one where the route followed a clockwise trajectory and the other, counter-clockwise. After viewing all possible combinations of clockwise, counter-clockwise, starting landmark, and VE, subjects were trained to perform a new task involving mental imagery-based navigation of the routes. On each trial of this task, which subjects performed with their eyes closed, cued as to which VE they should imagine themselves in, which landmark to start at, and which landmark should be the first that they pass as they mentally circumnavigate their way around the perimeter of the VE, back to the starting landmark. We used a support vector machine classifier within a leave-one-run-out cross validation scheme to decode video-viewing trials according to which of the three worlds the video took place in. Likewise, we examined the data by splitting the video-viewing trials by which direction the video was heading, irrespective of world. We then labeled the mental imagery task data in the same fashion. Lastly, we trained the classifier using all available perception task data and tested using mental imagery data. Each of these data analytic strategies was implemented using a searchlight-based information-mapping framework. When using BOLD activity pattern acquired during video viewing, we were able to predict which world the subject was viewing with classification accuracies upwards of 70% when our searchlight sphere was centered on voxels in visual cortex. During mental imagery, significant regions expanded, with comparable accuracies, to BA10. 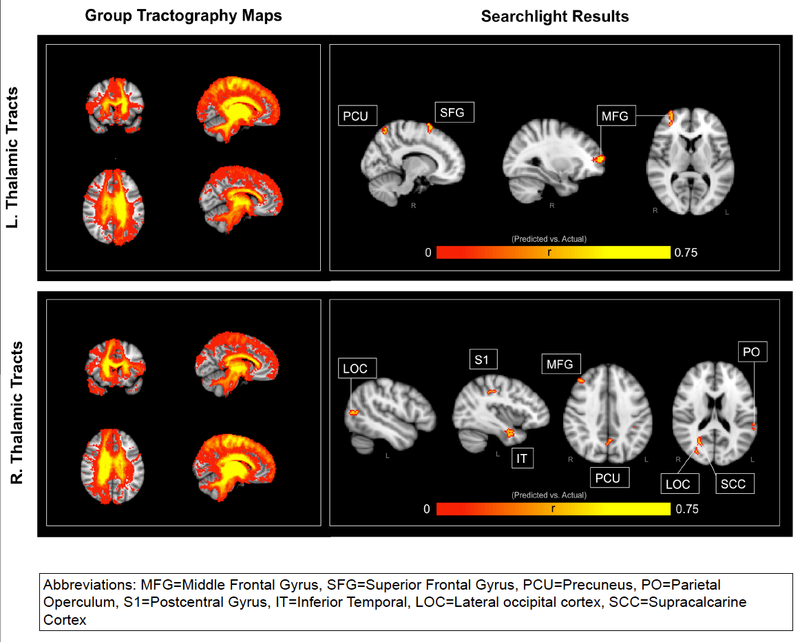 We were also able to predict which direction subjects were viewing/imaging with significant accuracies relying on information from occipito-temporal and medial frontal regions, respectively. When the classifier was trained on video viewing data and tested on mental imagery data we were most successful at decoding which world the subject was imagining themselves in when the searchlight sphere was centered on the caudate or the LOC; decoding direction revealed significant effects in the cerebellum and temporal lobes. By analyzing fMRI activity patterns measured during individual trials, we can predict the navigationally pertinent contents of an individual’s visual and mental workspace with a reasonably high degree of accuracy. The authors would like to thank Defense Advanced Research Projects Agency (DARPA), for its support of this project under grant No. D13AP00057. A natural intuition emerges when one becomes versed in the sensory transduction mechanisms of the human brain: information that was once observer-independent can be continually translated and interpreted along hierarchical processing streams so as to eventually represent that sensory stimuli by way of a unified subjective experience. In a conceptually similar manner to the refinement of earth-gems through the lengthy process of sanding, buffing and polishing, spatiotemporal patterns of photon absorption by photoreceptors in the retina follow a pathway to higher cortical areas each compartmentally necessary for identifying the edges, color, gestalt grouping, and motion embedded in those patterns. As such, it appears as though information evolves as it moves through each cortical processing unit until it reaches a sufficiently coherent threshold for awareness. However, adroit neuroscience experiments have revealed a fault in this intuition; subjective awareness of higher order information, at least within the visual pathways, depends on recurrence by way of neural backprojections across cortical areas thought to be solely dedicated to specific components of visual-percept information evolution. Area V1 in the human brain has been classically associated with first stage of cortical processing of visual information (Panizza, 1855)—containing a complete map of the visual field. Area V5, also known as MT, the suspected recipient of pre-processed visual information from V1, is thought to be responsible for the perception of motion (Zeki, 1991). Apart from the neural recordings in or observation of blood flow to these areas that speak to the correlation of their respective neural activity with presentation of visual stimuli, it is also possible to query a human’s subjective experience after artificial, spatially-selective neuromodulation to these regions by way of transcranial magnetic stimulation (TMS). In an affirmative demonstration of functional specialization within key visual regions, TMS applied to V1 enforces the percept of a stationary light-ball flash known as a phosphene (Marg, 1994) whereas application to V5/MT enforces the percept of moving phosphenes (Hotson, 1994). The generation of a static phosphene by stimulation of V1 seems compatible with this region’s role in elementary visual processing. However, the creation of a moving phosphene after stimulation of MT is a bit more puzzling—if MT is higher up on the information evolution stream of hierarchical visual processing, then how could MT elicit the percept of a phosphene, the more elementary component of the holistic percept? It would seem as though V1’s processing capabilities would need to be recruited in order to fully form this percept—a step-back in the supposed hierarchical processing stream. A clever experiment spearheaded by Pascual-Leaon (2001) provides an insight that both resolves this “step-back” confusion and dissolves the initial natural intuition of independent, feed-forward nodes along the visual processing stream. With the working hypothesis that fast backprojections from MT to V1 are necessary for visual awareness of moving stimuli, Pascual-Leone and Walsh (2001) applied TMS to both areas with varying temporal delays so as to examine the effects of disrupting the information transfer between the two regions. Specifically, the research duo hypothesized that “if the V5 to V1 backprojection is critical for awareness, disruption of activity in V1 at the time of arrival off feedback should interfere with the perception of attributed encoded by the [V5/MT] area” (Pascual-Leone, 2001). To begin with, the researchers identified the stimulation thresholds in both V1 and V5 necessary for creating a stationary and moving phosphene, respectively. This allowed for the researchers to use two TMS coils so as to, if applied with no temporal day (i.e at the same time), create overlapping phosphenes—one stationary and one moving. Their data revealed that sub-phosphene-threshold stimulation of V1 prevents the V1-induced phosphenes from appearing alongside the V5-induced-phosphene when the two stimulations are temporally synchronous. When TMS was applied to V1 before V5, there was never an effect on the perceived movement of the phosphene, regardless of the temporal asynchrony. This finding is in line with the natural intuition posited earlier– if V1 is responsible for creating a phosphene and MT for its movement, then stimulating V1 before MT would be compliant with the natural order of information processing. However, when V5 stimulation occurred before V1 sub-phosphene-threshold stimulation, subjects collectively reported a decrease in the quantity and quality of the phosphene (or its disappearance altogether) as compared to a pure V5 moving-phosphene-stimulation. Specifically, all subjects in this study reported that this stimulation condition (V1 stimulation 45ms after V5), in the majority of trials, created a stationary phosphene instead of a moving one. This finding would insinuate that V1 is somehow associated with the V5-induced moving phosphene. Previous research has suggested that V5 projects to V1 over a short time course, such as the ones utilized in the Pascual-Leone(2001) experiment(Heller, 1995; Nowak, 1997). Evidently, these V5 to V1 backprojections are necessary for the visual percept of properties that were naively assumed to be local to V5. This conclusion is corroborated by the case study of a blind patient, G.Y., who had a lesion that primarily affected V1. G.Y., while receiving TMS stimulation to V5, reported no forced percept of a moving phospene, yet retained the interesting percept of movement without visual perception (gnosanopsia) (Zeki, 1998). Additionally, as revealed by fMRI, G.Y.’s MT recruited blood-flow for neuronal activity whenever he was presented with moving stimuli (Zeki, 1998). Dubbed Riddoch syndrome, this phenomenon of gnosanopsia illustrates the importance of V1 in visual awareness, even if activity is observed in V5/MT. This evidence collectively suggests that activity in V5/MT that is permitted to propagate to V1 forms a unified visual percept of a moving visual object. In the absence of a functional V1, the percept of motion can be retained; artificially modulating V1 after MT activity will prevent the unification of motion and raw visual percept. In accordance with such findings, Bullier (2001) suggest that areas V1 and V2 may serve as “active blackboards” that integrate the results of computations performed in higher order areas, at least for the early stages of processing—essentially resulting in an area that can bind all relevant features of a stimulus into a unified percept. Further support of this theory comes by way of Lamme et al. (2000) who showed that the order in which cortical areas are activated does not necessarily correspond to that predicted by the hierarchical organization of areas. Such suggestions have a theoretical basis that may find its roots in subcortical-cortical circuitry. It has been shown that magnocellular (M) cells from the LGN reach V1 20ms earlier than parvocellular (P) cells (Nowak, 1995). This systematic delay in processing could allow for briefly orthogonal computational avenues, followed by a reintegration of preprocessed information (Bullier, What is fed back?). Specifically, if computation pertinent to M cells can be accomplished in higher order visual areas and then the resultant information, stored as a spatiotemporal patterns of firing, could be backprojected back to earlier visual areas like V1 to integrate with P cell activity. Thereby, it would seem as though neurons in V1 are recycled after their initial early-visual processing to hold a final percept that mysteriously yields subjective, conscious awareness. Additional, somewhat contradictory, evidence suggest that area MT and V1/V2 are routinely activated at the exact same time in macaques (Raiguel, 1989). This evidence posits that it could be theoretically plausible that conscious awareness of a unified percept is not created by any one isolated region, but instead the temporally synchronous activation of each isolated region, allowing for an emergent, non-physical phenomenon to represent each individual component as part of a unified whole. If such a postulate were true, the Pascual-Leone (2001) results could be interpreted as follows: TMS stimulation to V1 after MT prevented the maintenance of V1’s contributions to a unified percept and resulted in the common experience of the disappearance of a percept altogether. Furthermore, since TMS induces a relatively widespread cortical modulation (Fuggetta, 2005), it could be the case that TMS to V1 also modulated V5 activity and vice-versa, further confounding the interpretations. Lastly, the percept of a moving phosphene after V5 stimulation like in Hotson (1994) could be explained by a propagation of stimulation to V1, allowing, eventually, the temporally synchronous activity in V5 and MT—producing a moving phosphene. In order to resolve these two potential explanations for the dependencies between V1 and V5 for conscious motion perception (recurrent backprojections to V1 for integration vs. temporally synchronous emergent integration) and the potential for mistargeted neuromodulation, I would like to propose an experiment where the cortical targets for highly-specific modulation includes the white-matter between theV1 and V5. The first stage would be to complete a functional localizer with fMRI that selectively identifies the MT and V1 in a human. Second, a high-resolution diffusion weighted image would be collected. Using the MT and V1 regions of interest, one could use diffusion tensor techniques (Descoteaux, 2009) to probabilistically track the projections of voxels in MT that reach V1. The end result would be the identification of an isolated tract of white matter that specifically connects MT and V1—the tract by which the purported backprojections would presumably propagate. Finally, researchers could set up a multi-array setup of low intensity focused ultrasound pulsation (LIFUP) devices—one targeting MT, one targeting V1, and one focused on the unveiled white-matter tract between them. Since LIFUP has a near three-fold increase in neuromdulatory spatial specificty compared to TMS (Bystritsky, 2011), I would feel more confident in the actual, selective modulation of the intended areas. By using LIFUP at frequencies that encourage neural activity, one could replicate Marg (1994) and Hotson’s (1994) TMS findings after stimulation to V1 and V5. Furthermore, LIFUP could be used to selectively depress the propagation of activity in the elucidated white matter between V1 and V5—rendering communication between the two regions ineffective. This affords the experimental opportunity to activate both V1 and V5 alongside the depression of their white matter connectivity in a temporally synchronous manner. Thus, if a subject reported seeing a moving phosphene under this stimulation condition (a naturally implausible state of affairs without the advent of such neuromodulatory technology) it would be evidence that it is merely the temporally synchronous activity of specialized cortical regions that gives rise to conscious percepts of visual motion independent of their back-and-forth communications. If subjects do not report this moving phosphene, the study would conclude by exactly replicating the Pascual-Leaon (2001), but with the increased spatial resolution afforded by LIFUP. This latter course of events, pending a replication, would permit the default on accepting the working theory that V5’s recurrent connectivity with V1 is necessary for the formation of a unified conscious percept. Bullier, Jean. “Feedback connections and conscious vision.” Trends in cognitive sciences 5.9 (2001): 369-370. Bullier, Jean, et al. “The role of feedback connections in shaping the responses of visual cortical neurons.” Progress in brain research 134 (2001): 193-204. Bystritsky, Alexander, et al. “A review of low-intensity focused ultrasound pulsation.” Brain stimulation 4.3 (2011): 125-136. Descoteaux, Maxime, et al. “Deterministic and probabilistic tractography based on complex fibre orientation distributions.” Medical Imaging, IEEE Transactions on 28.2 (2009): 269-286. Fuggetta, Giorgio, Antonio Fiaschi, and Paolo Manganotti. “Modulation of cortical oscillatory activities induced by varying single-pulse transcranial magnetic stimulation intensity over the left primary motor area: a combined EEG and TMS study.” Neuroimage 27.4 (2005): 896-908. Heller, Joshua, et al. “Information flow and temporal coding in primate pattern vision.” Journal of computational neuroscience 2.3 (1995): 175-193. Hotson, John, et al. “Transcranial magnetic stimulation of extrastriate cortex degrades human motion direction discrimination.” Vision research 34.16 (1994): 2115-2123. Lamme, Victor AF, and Pieter R. Roelfsema. “The distinct modes of vision offered by feedforward and recurrent processing.” Trends in neurosciences 23.11 (2000): 571-579. Marg, Elwin, and David Rudiak. “Phosphenes induced by magnetic stimulation over the occipital brain: description and probable site of stimulation.” Optometry & Vision Science 71.5 (1994): 301-311. Nowak, Lionel G., and Jean Bullier. “The timing of information transfer in the visual system.” Extrastriate cortex in primates. Springer US, 1997. 205-241. Nowak, L. G., et al. “Visual latencies in areas V1 and V2 of the macaque monkey.” Visual neuroscience 12.02 (1995): 371-384. Pascual-Leone, Alvaro, and Vincent Walsh. “Fast backprojections from the motion to the primary visual area necessary for visual awareness.” Science 292.5516 (2001): 510-512. Raiguel, Steven E., et al. “Response latencies of visual cells in macaque areas V1, V2 and V5.” Brain research 493.1 (1989): 155-159. Zeki, Semir, et al. “A direct demonstration of functional specialization in human visual cortex.” The Journal of neuroscience 11.3 (1991): 641-649. Zeki, Semir, and D. H. Ffytche. “The Riddoch syndrome: insights into the neurobiology of conscious vision.” Brain 121.1 (1998): 25-45. Coluracetam, initially synthesized in Japan, was first introduced to the scientific research community in 1993 as a choline uptake enhancer that selectively affected memory-related mechanisms23. Coluracetam’s mechanisms of action and specific behavioral effects were investigated by the Mitsubishi Tanabe Pharma Corporation under the guise of its suitability for the treatment of Alzheimer’s disease 2–4. Coluracetam’s license was repurposed in 2009 when Brain Cells, Inc. began a 90 patient phase II clinical trial to examine effects on depression and anxiety24. Seeing as its purported rehabilitative effects are postulated to extend to an enhancement of baseline operations, Coluracetam has also gained traction within the online nootropic community 15,22. In rats with a laboratory induced memory deficit by way of injection of ethylcholine mustard aziridinium ion (AF64A—a selective neurotoxin that elicits degeneration of cholinergic neurons 4 – which massively innervate the hippocampus 5 ,6), the oral administration of Coluracetam (.3ml, 1mg, and 3mg per 10kg body weight once daily for 12 days preceding the test) ameliorated the memory deficit in a delayed non-match to sample task—a classic measure of hippocampal dependent recognition memory 13, compared to control mice injected with saline 9. Results using similar procedures show similar amelioration of memory deficits up to 24hrs after administration in regards to performance on Morris water maze and radial-arm maze tasks 1 – a classic behavioral procedure for studying spatial learning 12. No significant side effects are observed in the rodents at these effective doses 11. Taken orally three times daily for six weeks in dosages of 80mg, Coluracetam significantly lowered the severity of self-reported depression in patients with co-morbid major depressive disorder and general anxiety disorder who were previously deemed unresponsive to an average of two antidepressants [12.2 points lower on Hamilton Rating Scale for Depression compared to 5.5 points in placebo group; N=101; p< .0008]20. This effect was selective to individuals with co-morbidity; there was no difference between the overall treatment group and placebo. In scenarios where AF64A selectively decreased hippocampal ACh content, Coluracetam significantly reversed the depletion induced by AF64A at doses of .3mg/kg and 1mg/kg 9. Additionally, 3mg/kg of Coluracetam increased ACh concentration in perfusate in hippocampal slices by 263% compared to the AF64A deficit 2. An extension of this finding showed that the increase in ACh induced by a single administration of Coluracetam revealed no Coluracetam in the brain 3 hours after dosing 2. Researchers have also observed other neurochemical correlates of Coluracetam ingestion. For example, decreased High affinity choline uptake (HACU) concentration and high Potassium stimulation-induced Acetylcholine (ACh) release (but not basal ACh release) in hippocampal synaptosomes after AF64A administration are reversed to near-pre-deficit levels following the administration of Coluracetam. However, this increase in HACU does not expand to non-AF64A administered rats 2. Furthermore, Coluracetam significantly reduced the decline in repeated depolarization-induced release of ACh in AF64A-treated rats and increased the extracellular ACh basal concentration in the hippocampus of AF64A treated rats. The observation that dosage scales with behavioral effects (e.g induced reversal of AF64A induced working memory deficits), suggests a probable neurochemical correlate for Coluracetam. However, the absence of Coluracetam during the persistence of behavioral enhancements suggests that Coluracetam sets into motion a cascade of longer-lasting neurochemical effects beyond simply playing an agonistic role. Seeing as the majority of the research that examined the neurochemical effects of Coluracetam was done in the context of rodents altered by way of AF64A to serve as models for Alzheimer’s Disease (AD), it is useful to recognize the mechanisms that make up the altered system. A hallmark of AD is the depletion of cholinergic-related processes that are intimately tied to hippocampal circuitry. The degree of deficit in cholinergic markers (HACU, choline acetyltransferase(ChAT) activity, ACh synethsis, ACh release) has been shown to be most closely correlated with the severity of cognitive imparment in senile dementia and Alzheimer’s disease21, 7 ,8. AF64A can selectively degenerate cholinergic-related processes and, in turn, operationally produce AD-like symptoms. More specifically, AF64A has been shown to inhibit HACU, reduce choline acetyltransferase activity, lower the release and content of ACh in the hippocampus of mice 10,11, and decrease binding of choline transporters 16. Furthermore, in hippocampal slices of AF64A-treated rats, depolarization-induced ACh release is decreased with repetition of stimulations 14. Thus, for all intents and purposes, AF64A-treated animals are considered to model AD in concerns to its largest correlate: diminished ACh related activity. Coluracetam has been shown to facilitate ACh synthesis in vitro and increase ACh concentration in in-vivo microdyalisis in AF64A-treated rats 2. However, as with any neurotransmitter modulation, this observed increase in ACh can be accomplished in a vast array of ways. For example, Coluracetam could, itself, serve as a cofactor for ACh—this is ruled out, however, due to its absence despite presence of behavioral benefits and increased ACh; it could serve as a reuptake inhibitor—however, Coluracetam did not affect AChE activity 14, which would normally hydrolyze acetylcholine; or it could serve as an acceleration factor for the enzymatic processes who’s downstream results yield a higher presence of ACh. This latter route is most likely the mechanism of action by which Coluracetam operates. HACU is the system in which choline, an ACh substrate, is up taken from the synapse and utilized for the manufacturing of ACh by way of ChAT. HACU at the presynaptic cholinergic terminal is considered to be a rate-limiting step in the ACh synthesis process because the system’s overall efficiency (velocity) is subject to a variety of environmental factors including, but not limited to, temperature and Choline availability. The speed with which HACU transports choline has correlated with the activity of cholinergic neurons 17. It has been observed that the maximal velocity (Vmax) of HACU is decreased in the presence of AF64A-treated rats. This Vmax is restored in the presence of Coluracetam. However, there was no significant change in the Michaelis-Menten constant (Km). Seeing as Km is the rate of enzymatic reactions in accordance with the concentration of the substrate, it appears as though Coluracetam is particularly increasing the efficiency of HACU, not just increasing the presence of the substrates necessary for the enzymatic process. CHT1, a high-affinity choline transporter, has been associated with the up-regulation of HACU 18. CHT1 has been shown to increase its presence in the synaptic membrane during times of low HACU by its release from the cytoplasmic compartment 16. Specifically, CHT1 has been shown to bind to vesicles containing ACh in the presynaptic neuron move into the synaptic membrane when the vesicle is exocytosed 18. CHT1 is increased in synaptic membranes following in-vivo administration of Coluracetam 3. Researchers posit that the increase in choline transporters like CHT1 on the plasma membrane which leads to the rapid availability of choline for ChAT and overall velocity of the HACU system is based on the Coluracetam’s modulation of the vesicular trafficking system of CHT1. Since Coluracetam has been shown to have a direct affinity for CHT1 3, the two’s interaction may increase the ability for CHT1 to be released from the cytoplasm and onto the plasma membrane, where it can carry out its reuptake role. Another theory is that Coluracetam may interfere with the internalization step of CHT1 from the surface of the synaptic membrane to cystolic pool, thus allowing CHT1 to continually aid in choline transportation. Further evidence of this is shown by Coluracetam’s interaction with cystolic anchor proteins that negatively regulate membrane surface expression of CHT1, which increases in AD 19. Given that Coluracetam alters ACh availability in the synapse, but only after stimulation induced ACh efflux, it follows that a system responsible for the recycling of that released ACh is the primary mechanism of action by which Coluracetam acts. HACU is that recycling system. For, after ACh is broken down into Choline by AChE in the synapse, the choline needs to reach the cytoplasmic ChAT in order to be synthesized into ACh again. HACU is the “rate-limiting-factor” of ACh production as measured by the system’s overall ability to make choline available for ACh synthesis. Increased CHT1 is responsible for the enhancement of this HACU system by way of accelerating choline transportation back into the presynaptic neuron and, subsequently, increasing the rapidness of available ACh (since ChAT velocity is affected by choline availability). Coluracetam is thought to aid either CHT1’s vesicular-bound release into the synapse, CHT1’s reuptake prevention, or CHT1s’s anchoring stability on the plasma membrane. Coluracetam’s increase of CHT1’s functional availability allows for CHT1 to more adequately perform its task whose downstream result is an increase in density and probability of synaptic ACh concentration. Since cholinergic neuron projection is most prominent in the hippocampus, it is no surprise that Coluracetam ameloriates the working memory deficits imposed by AF64A treatment. As for why, in humans, administration of Coluracetam alleviates anxiety and depression when the two are co-morbid, a clear correlate is unclear. The benefit could be related to the role of a healthy hippocampus in modulating the Default Mode Network25, a network known to be involved in internal trains of thought26. Why are all the results only seen in the presence of a deficit (AF64-A administration)? ; In the highlighted studies used to create this perspective piece, Coluracetam never shows any benefit in control rats. Perhaps…since AF64A decreases ACh at synaptic terminals and ACh concentration is a factor in HACU rate, then HACU rate has more potential for improvement during diminished ACh concentration. Since most enzymatic processes operate at near-optimal efficiency at baseline, it would be hard-pressed to see an effect from transporters like CHT1 on HACU. Perhaps this is why transporters like CHT1 can be released as spare “backups” from the cytoplasm to the plasma membrane only after a toxin-induced damage. Bessho, T., Takashina, K., Eguchi, J., Komatsu, T. & Saito, K.-I. MKC-231, a choline-uptake enhancer: (1) long-lasting cognitive improvement after repeated administration in AF64A-treated rats. J Neural Transm 115, 1019–25 (2008). Takashina, K., Bessho, T., Mori, R., Eguchi, J. & Saito, K.-I. MKC-231, a choline uptake enhancer: (2) Effect on synthesis and release of acetylcholine in AF64A-treated rats. J Neural Transm 115, 1027–35 (2008). Takashina, K. et al. MKC-231, a choline uptake enhancer: (3) Mode of action of MKC-231 in the enhancement of high-affinity choline uptake. J Neural Transm 115, 1037–46 (2008). Malykh, A. & Sadaie, M. Piracetam and piracetam-like drugs: from basic science to novel clinical applications to CNS disorders. Drugs 70, 287–312 (2010). Sandberg, K. et al. AF64A: An Active Site Directed Irreversible Inhibitor of Choline Acetyltransferase. J Neurochem 44, 439–445 (1985). Lewis, P. R. Confirmation from choline acetylase analyses of a massive cholinergic innervation to the rat hippocampus. J. Physiol 191, 15–224 (1967). Cobb, S. & Davies, C. Cholinergic modulation of hippocampal cells and circuits. The Journal of Physiology 562, 81–88 (2005). Otto, T. & Eichenbaum, H. Neuronal activity in the hippocampus during delayed non‐match to sample performance in rats: Evidence for hippocampal processing in recognition memory. Hippocampus 2, 323–334 (1992). Murai, S. et al. MKC-231, a choline uptake enhancer, ameliorates working memory deficits and decreased hippocampal acetylcholine induced by ethylcholine aziridinium ion in mice. J. Neural Transmission 98, 113 (1994). Morris, R. Developments of a water-maze procedure for studying spatial learning in the rat. Journal of Neuroscience Methods 11, 4760 (1984). Bessho, T. et al. Effect of the novel high affinity choline uptake enhancer 2-(2-oxopyrrolidin-1-yl)-N-(2,3-dimethyl-5,6,7,8-tetrahydrofuro[2,3-b] quinolin-4-yl)acetoamide on deficits of water maze learning in rats. Arzneimittelforschung 46, 369–73 (1996). Davis, K. et al. Cholinergic Markers in Elderly Patients With Early Signs of Alzheimer Disease. JAMA 281, 1401–1406 (1999). Perry, E. et al. Correlation of cholinergic abnormalities with senile plaques and mental test scores in senile dementia. BMJ 2, 14571459 (1978). Chrobak, J. & Walsh, T. Dose-and delay-dependent working/episodic memory impairments following intraventricular administration of ethylcholine aziridinium ion (AF64A). Behavioral and Neural Biology 56, 200212 (1991). Abe, E., Murai, S., Masuda, Y., Saito, H. & Itoh, T. Reversal by 3,3?,5-triido-l-thyronine of the working memory deficit, and the decrease in acetylcholine, glutamate and ?-aminobutyric acid induced by ethylcholine aziridinium ion in mice. Naunyn-Schmiedeberg’s Arch Pharmacol 346, 238242 (1992). Rylett, R., Ball, M. & Colhoun, E. Evidence for high affinity choline transport in synaptosomes prepared from hippocampus and neocortex of patients with Alzheimer’s disease. Brain Research 289, 169175 (1983). Kuhar, M. & Murrin, L. SODIUM‐DEPENDENT, HIGH AFFINITY CHOLINE UPTAKE. J Neurochem 30, 15–21 (1978). Ferguson, S. & Blakely, R. The Choline Transporter Resurfaces: New Roles for Synaptic Vesicles? Molecular Interventions 4, 2237 (2004). Xie, J. & Guo, Q. Par-4 Inhibits Choline Uptake by Interacting with CHT1 and Reducing Its Incorporation on the Plasma Membrane. Journal of Biological Chemistry 279, 28266–28275 (2004). BrainCells, Inc. Trial Results. BrainCells Inc. Announces Results from Exploratory Phase 2a Trial of BCI-540 in Depression With Anxiety: Positive Signal Observed in Difficult-to-Treat Patient Population. Evaluate Group. Evaluate, Ltd., 14 June 2010. Web. 4 Dec. 2014. <http://www.evaluategroup.com/ Universal/View.aspx?type=Story&id=216319>. Cummings, Jeffrey L., and Carla Back. “The cholinergic hypothesis of neuropsychiatric symptoms in Alzheimer’s disease.” The American Journal of Geriatric Psychiatry 6.2 (1998): S64-S78. “Nootropics Forum Search: Coluracetam.” Reddit. Web. 11 Dec. 2014. <http://www.reddit.com/r/Nootropics/search?q=coluracetam&restrict_sr=on&gt;. Bessho, T., et al. “Effects of MKC-231, a novel choline uptake enhancer, on AF64A-induced reduction of high affinity choline uptake and impairment of water maze learning in rats.” Jpn J Pharmacol 61 (1993). NeuroInvestment. Company Spotlight: BrainCells Inc. Oxford Bioscience Partners. N.p., Sept. 2009. Web. 4 Dec. 2014.<http://www.oxbio.com/ pressreleases/090909_BCI.pdf>. Greicius, Michael D., et al. “Functional connectivity in the resting brain: a network analysis of the default mode hypothesis.” Proceedings of the National Academy of Sciences 100.1 (2003): 253-258. Smallwood, Jonathan, et al. “Cooperation between the default mode network and the frontal–parietal network in the production of an internal train of thought.” Brain research 1428 (2012): 60-70. Zheng, Z., Reggente, N., Lutkenhoff, E., Owen, A., Monti, M.
Brief: In this study we used probabilist tractography on diffusion tensor imaging data to look at the whole brain’s anatomical connectivity index with the Left and Right Thalamus for patients with varying disorders of consciousness. Using a searchlight mapping procedure, we trained a Support Vector Regression on all but one patient and attempted to predict a left out subject’s “Coma Recovery Scale” value (leave-one-patient-out cross-validation). That is, we looked at each region in the brain and asked the question “Does this region’s connectivity with the thalamus provide us with significant predictive power in regards to a DOC patient’s level of awareness?”. We were able to capture a significant portion of the variance (upwards of 56% of the variance), especially when drawing features for the SVR from regions such as the Middle Frontal Gyrus, Superior Frontal Gyrus, Precuneus, Parietal Operculum, Postcentral Gyrus, Inferior Temporal, Lateral Ocipital cortex, and Supracalcarine Cortex. Of particular intrigue is the contra-lateral importance of these connections. Thus, the ability for the Thalamus to anatomically connect with these regions significantly predicts levels of consciousness. A reliable neural biomarker would serve as a valuable prognostic indicator for the assessment of awareness in patients with disorders of consciousness (DOC). Previous research has suggested that DOC may reflect disconnections in the thalamocortical networks. In this current study, we used probabilistic tractography to investigate the structural connectivity between the thalamus and the rest of the brain in 23 patients with varying levels of awareness as measured by the coma recovery scale-revised (CRS-R). The CRS-R spans six subscales aimed at assessing overt consciousness: auditory, visual, motor, oromotor, communication, and arousal. We obtained a total CRS-R score for each patient by summing across all six-subscale scores, where a maximum total score would be 23 points. We employed a searchlight mapping approach by centering a 5mm sphere at each voxel in the brain. The thalamic-connectivity-index values of voxels within each sphere were used as predictors in a support-vector-regression. The predictive power of our model was assessed by a leave-one-patient-out cross-validation whereby we iteratively trained a support-vector-regression model on 22 subjects and applied that model to the left-out subject. The resulting vector of predicted CRS-R scores correlated with the actual CRS-R scores most strongly when the searchlight was centered in Middle Frontal Gyrus and Precuneus. More specifically, connections with the left thalamus in these regions accounted for upwards of 44% of the variance in CRS-R scores. Furthermore, lateral occipital cortext and Right Supracalcarine Cortex accounted for up to 56% of the variance in CRS-R scores. These results provide neural bases for the level of conscious awareness displayed by DOC patients. More specifically, this investigation highlights the importance of thalamo-prefrontal and thalamo-temporal circuits in establishing a dependable anatomical metric for calculating patients’ CRS-R scores. Such findings support the “disconnection syndrome” hypothesis by illustrating that decreases in structural connectivity throughout the brain correlates with degradations in conscious awareness. 1. Schiff, N.D., 2010. Recovery of consciousness after brain inury: a mesocircuit hypothesis. arousal and awareness. Brain Res Brain Res Rev. 39, 107-40.
connectivity connectivity during anesthesia-induced transitions in consciousness. vegetative state. Lancet 355, 1790-1 (2000). 5. Lutkenhoff, E.S., McArthur, D.L., Hua, X., Thompson, P.M., Vespa, P.M., & Monti, M.M. Kommers, C.,, Reggente, N., Raccah, O., Rissman, J. Although the hippocampus is well known to contribute to the storage and retrieval of long-term memories, emerging data suggests that the hippocampus may also contribute to the online maintenance of task-relevant representations in some tests of working memory. To the degree that hippocampal mechanisms serve to facilitate performance on short delay memory tasks, individual differences in hippocampal microstructure could contribute to across-subject variance in working memory performance. To examine the relationship between hippocampal structure and function, we obtained the diffusion-weighted images (DWI) of a large cohort of subjects from the Human Connectome Project MRI dataset. We used the DWI to compute diffusion tensor images (DTI), which in turn were used to generate whole-brain mean-diffusivity (MD) maps. MD in deep gray matter has been construed as an indirect measurement of local microstructural deficits (Kim et al., 2013). Thereby, we aimed to assess the underlying integrity of each subject’s hippocampal gray matter and use examine whether these measures can account for variance in memory performance across subjects. Hippocampal regions of interest (ROIs) were identified using Freesurfer’s automated segmentation algorithm. 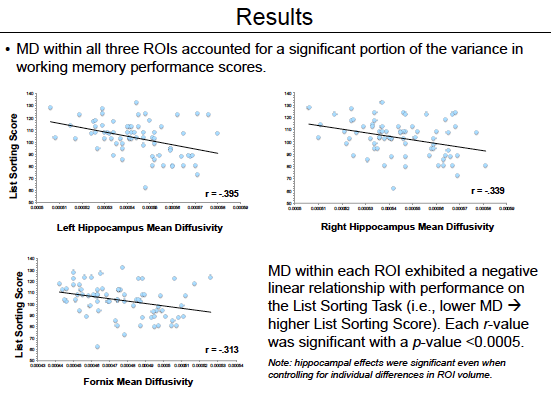 Average MD within the left hippocampus was found to be significantly correlated with performance on a Working Memory List Sorting Task. This result is consistent with prior work showing that hippocampal MD serves a predictor for verbal and visuospatial memory (Carlesimo et al., 2010). Furthermore, MD along the Fornix (acquired from the Johns Hopkins White Matter Atlas) also significantly correlated with performance on the same task. This result illustrates that in addition to local integrity, the health of the hippocampus’s primary output tract is equally as important in explaining behavior that purportedly depends on hippocampal circuitry. This current study extends these previous findings and contributes to the debate surrounding the role of the hippocampus in working memory. We plan to conduct further analyses aimed at characterizing the potentially important role of fronto-hippocampal connectivity in working memory performance. 1) Ranganath, C., & Blumenfeld, R.S. (2005). Doubts about double dissociations between short- and long-term memory. Trends Cogn Sci, 9(8), 374–380. 2) Rissman, J., et al. (2008). Dynamic adjustments in prefrontal, hippocampal, and inferior temporal interactions with increasing visual working memory load. Cereb Cortex, 18(7), 1618–1629. 3) van Vugt, M. K., Schulze-Bonhage, A., Litt, B., Brandt, A., & Kahana, M. J. (2010). Hippocampal gamma oscillations increase with memory load. J Neurosci, 30(7), 2694–2699. 4) von Allmen, D.Y., et al. (2013). Neural activity in the hippocampus predicts individual visual short-term memory capacity. Hippocampus. 5) Winston, G.P., et al. (2013). Structural correlates of impaired working memory in hippocampal sclerosis. Epilepsia, 54(7), 1143–1153. 6) Yee, L.T.S., et al. (2014) Short-term retention of relational memory in amnesia revisited: accurate performance depends on hippocampal integrity. Frontiers in human neuroscience 8, 16. 7) Van Essen, D.C., et al. (2013). The WU-Minn Human Connectome Project: An overview. NeuroImage 80(2013):62-79. 8) Kim, H.J., et al. (2013) Alterations of mean diffusivity in brain white matter and deep gray matter in Parkinson’s disease. Neuroscience Letters 550: 64-68. 9) den Heijer, T., et al. (2012). Structural and diffusion MRI measures of the hippocampus and memory performance. NeuroImage, 63(4), 1782–1789. 10) Carlesimo, G.A., et al. (2010). Hippocampal mean diffusivity and memory in healthy elderly individuals: a cross-sectional study. Neurology, 74(3), 194–200. Westphal, A.J., Monti, M.M., Reggente, N., Yazdanshenas, O., & Rissman, J. The act of retrieving a memory for a specific episode of one’s past requires the coordination of brain networks involved in controlling access to mnemonic contents and representing and monitoring the stored information. This has been shown to invoke a brain connectivity profile that diverges somewhat from the brain’s intrinsic resting state organization (Fornito et al., 2012). However, it is not yet clear to what degree this “retrieval mode” brain state differs from that observed during other complex cognitive tasks. In order to examine this further, we performed a graph theoretical analysis on fMRI functional connectivity data patterns measured while participants (N = 20) alternated between the performance of episodic source memory retrieval, analogical reasoning, and visuospatial perception tasks. In order to avoid systematic confounds, we ensured that the tasks were matched for response demands, reaction times, and bottom-up visual processing. Following preprocessing, we extracted fMRI time-courses from each 40 sec task block and concatenated these across runs to generate task-specific time-courses. We next reduced our whole brain data set to 264 functional areas, identified by resting state parcellation and meta-analysis (Power et al., 2011) and defined as spherical regions of interest (5mm radius). Pairwise correlations were then computed between all pairs of nodes for each cognitive task, and the weakest connections were thresholded out at a range of sparsity values. To capture a key global property of brain network dynamics, we analyzed how much each task-set expressed a graph theoretic measure known as modularity (Newman, 2006), which assesses the amount of connectivity within identified networks versus between networks. Our data revealed that the memory retrieval task showed significantly reduced modularity in comparison to the reasoning and perception tasks, an effect that replicated across sparsity thresholds. This suggests that the memory task-set is characterized by more widespread connectivity across the brain. Strikingly, reduced modularity in individual subjects was diagnostic of fewer memory errors and improved source monitoring. Taken together, our results suggest that memory retrieval may benefit from lower modularity, presumably because otherwise competitive brain networks supporting externally-directed and internally-directed attention must work together to link environmental stimuli with an introspective mnemonic search process. In 1641 Rene Descartes sat, ball of wax in hand, pondering the flexibility of material states and how such impermanence spoke to an object’s essence. Hundreds of years later, cognitive neuroscientists are probing into the recesses of the human brain, assessing its task-dependent states, and forming hypotheses regarding the underpinnings of its malleability. Just like Descartes’ transforming wax, the human brain is in a state of constant flux. Observed endogenously, this metamorphic phenomenon of the brain is known as consciousness. In a seemingly relentless pursuit, philosophers and scientists alike have been enthralled by the ever so evasive conceptualizations of consciousness. However, despite valiant efforts, a truly satisfying, all-encompassing theory has yet to emerge. Scientists’ hardships in this arena are entirely understandable. For, how does one yield a true understanding of something that is inherently numinous and ephemeral? Certainly the sophists grew tired of mere mind mulling on such topics and socially evolved into scientists. Scientists, in succession, have turned to sophisticated technologies for insights into the critical cortical loci necessary for conscious awareness. However, is it possible to understand all the components of an object and be immediately privy to a comprehension of its emergent properties? The scientific community’s quest for an understanding of consciousness thus far is reminiscent of the story of the blind men trying to explain what an elephant is by each touching different parts. While recent advances in neuroimaging have allowed for researches to capture the spatio-temporal signature of brain activity during a plethora of mental states, brain mapping still remains unsatisfactory in its attempts to grasp consciousness. Perhaps philosophy and science alone are incapable of providing the exploratory tools necessary for a succinct understanding of consciousness. In a non-mutually exclusive third branch of consciousness exploration reside the psychonauts; a nomenclature given to those who use a variety of methodologies to both achieve and describe altered states of consciousness. Conceivably, psychonautic experiences may be able to compliment the rigorous approaches currently employed by scientists and philosophers and yield a harmonious explanation for the universe’s greatest mystery. It will be the focus of this paper to elucidate plausible and safe methodologies for the merging of philosophy, science, and psychonautics while subsequently addressing the ethical dilemmas that arise from such a hypothetical collaboration. At first, this paper will speak to the neuroscientific correlations of brain structure with altered conscious states. Subsequently, this paper will address the potential for the recreation of those conscious states by the use of neuromodulatory devices. Lastly, it will lay forth the potential repercussions and ethical issues associated with such practices. Since the advent of phrenology, it appears as though mankind’s desire to understand the functioning of the brain has taken manifest as a brain-mapping effort that that seeks to correlate localized regions of the brain with specific modules of function. Galen of Greece (210 BC) was the first to correlate structure and function with his focus on the pineal gland’s role in producing ““psychic pneuma”, a fine, airy substance which he described as “the first instrument of the soul”(Rocca, 2003). Since, ancient, medieval, and renaissance philosophers continued to suggest that the pineal gland provided the “seat for the soul”. Currently, a vast array of neuroscience methods, including direct recordings, neuroimaging, and behavioral testing after localized brain damage, have allowed researchers to relate various brain structures with various behaviors. For example, the hippocampus has long been associated with the acquisition of new memories (Squire, 1992), the prefrontal cortex in cognitive control (Miller and Cohen, 2001), and the superior parietal cortex with spatial attention (Yantis et al., 2002). However, the reported existence of complex brain networks, where multiple cortical regions are activated in unison for particular genres of task states, has gained significant traction as a theory for dynamic cognitive function (Bullmore and Sporns, 2009; Sporns et al., 2004). Such theories seems to suggest that the concurrent, temporally locked activation of a multitude of brain regions gives rise to the emergent phenomenon of consciousness, whereby different collections of brain regions result in different states of consciousness. Research into the more ethereal states of consciousness has followed in similar suite to the rest of neuroscience’s ventures. That is, studies, while small in number, have pinpointed the different brain regions correlated with being in a state of meditation (Short et al., 2010; Lazar et al., 2000), trance (Peres et al., 2012), psychedelic states (Carhart-Harris et al., 2012), and sleep (Horovitz et al., 2008). These studies have paralleled the biochemical pursuits that attempt to identify the neurotransmitters whose presence in the brain is modulated by the ingestion of particular substances. For example, dopamine release has been affiliated with the use of cocaine (Ritz, 1987); serotonin with the use of lysergic acid diethylamide (LSD) (Nichols, 2004). Curiously, particularly potent psychedelic experiences, like those accomplished by drinking ayahuasca, rely on the ingestion of dimethyltriptamine (DMT), a compound found endogenously in mammalian species (Franzen and Gross, 1965). Furthermore, for the first time, DMT, and its precursors have been found in the pineal gland of rodents (Barker et al., 2013). This parallels the findings that dopamine is stored and released by specific brain areas, such as the pars compacta portion of the substnatia nigra (Geffen, 1976). Attempts to establish double-dissociations for the supposed responsibilities of brain areas in particular cognitive functions has led researchers to implement neuromodulatory tools that can selectivity potentiate and deactivate particular brain regions. Subsequent alterations in behavior in relation to the external modulation of cortical regions allow researchers to make claims that follow the format of “if region X is potentiated, then subject’s perform Y% better at task T”. 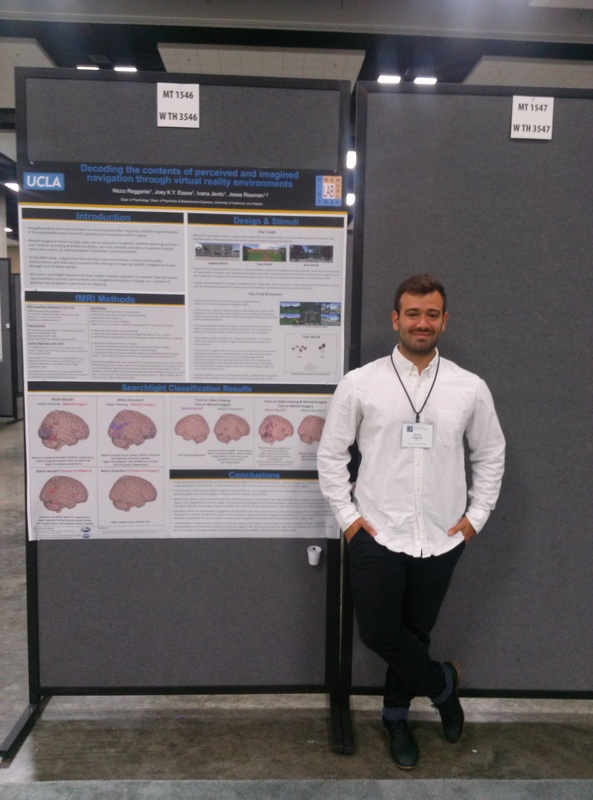 Techniques such as transcranial direct-current stimulation (tDCS) and repetitive transcranial magnetic stimulation (rTMS) have been used with great success to confirm the significance of a brain region’s involvement with particular behavioral tasks (for a review see Levasseur-Moreau et al., 2013). However, in accordance with the brain-network theories illustrated previously, it would seem as though the simultaneous stimulation of multiple sites would be necessary to invoke a subjective change in conscious state. TMS has been shown to alter the functional connectedness of brain networks with the stimulation of single nodes within that network (Pascual-Leone et al., 2000). Yet, the network activation is not a perfect rendition of the endogenously induced conscious state. Furthermore, the limitations of both TMS and tDCS (e.g their lack of spatial specificity and inability to modulate cortical regions deeper than 1.5cm of cortex) prevent the faithful activation of particular networks. Perhaps this is the reason behind why rTMS has highly variable evidence on inducing changes in conscious states such as depression (Loo and Mitchell, 2005) and no studies have been published reporting shifts in consciousness that parallel those reported by psychonauts. Fortunately, recent technological developments such as low intensity focused ultrasound pulsation (LIFUP) allow for far more acute spatial resolution (2mm) compared to rTMS (5cm) and tDCS. Additionally, LIFUP has the potential to practically stimulate any region in the brain since it can focus on brain regions greater than 15cm past the skull (Bystritsky et al., 2011). It can be theoretically postulated that if we can both identify networks of regions in the brain that are correlated with particular cognitive states and also precisely modulate brain activity, then we should be able to recreate particular conscious states exogenously. For example, if a subject were to ingest psilocybin and undergo an fMRI scan during the transition from normal waking consciousness to a psychedelic state, similar to Carhart-Harris et al. (2012), then a time-course of their brain activity would elucidate the transient activity of critical brain networks responsible for inducing the alteration in consciousness. Then, a precisely positioned array of LIFUPs aimed at the key nodes of interest could then reproduce the time-course of brain activity, remaining faithful to the spatial regions of interest and their fluctuations. Furthermore, LIFUP could be used to modulate the release of state-related neurotransmitters that have their locus in particular brain regions. If the adage that “the brain creates the mind” is coherent, then it should follow that this apparatus arrangement would recreate the psychedelic state that was initially experienced by the subject. Of principal notation, this proposed use of mechanical means to induce psychedelic states has the incredible benefit of removing the chemical ingestion component of psychedelic experiences. Many psychonauts suffer the consequences of ignorance towards a particular substance’s exact contents, their source, and the dosage. Such gaps in knowledge lead to unwanted side effects and potential overdoses. Furthermore, the mere act of ingesting chemicals can cause incredible discomfort (e.g ayuhausca requires a purge; psilocybin results in stomach uneasiness; THC causes dry-mouth). The removal of the need to insert chemicals into the body is an insurmountable advantage of noninvasive stimulation that mirrors psychedelic states. Interestingly, it could be the case that some of the mental side effects of many psychedelics (e.g anxiety) have the potential be eliminated by tailoring the patterns of spatio-temporal LIFUP activations in a way that excludes brain regions responsible for such side effects. Additionally, the effects of such a stimulation procedure are potentially transient; it could be the case that the effects only persist during stimulation. As such, a psychedelic experience could last as long as the user desires. This comes in stark contrast to the unavoidable duration of substance-induced psychedelic experiences. Perhaps such shifts in perspective could help scientists to approach research questions from new angles. Imagine a coffee break that consists of a five-minute psychedelic journey for an “inspiration jolt” before tackling a seemingly unsolvable problem. Scientists routinely value the input of fresh perspectives, as seen by the incredible success of employing video game players to “solve puzzles for science” (www.fold.it/portal). In an exemplary showcase, Francis Crick admitted to the effects of LSD in aiding his unraveling the structure of DNA, a discovery that won him the Nobel Prize (Rees, 2004). Hereby, it seems as though psychedelic states can issue thought-evoking and perspective-changing state of consciousness that may be of benefit to scientific discoveries. Thus, it seems as though mechanically induced states of consciousness are theoretically conducive to creativity whilst void of the prolonged length of inebriation and potential pharmaceutical side effects. However, the potential benefits of psychedelics continue into their ability to aid psychotherapists achieve breakthroughs with their patients. For example, both LSD and psilocybin have been used to help terminally ill patients cope with the inevitability of their death (Richards, 1972; Grob et al., 2011). MDMA has been used to treat post-traumatic stress disorder with a 75% success rate (Bouso et al., 2008). Additionally, Psilocybin has been used to effectively increase “emotional insight” in psychotherapy (Carhart-Harris et al., 2012a). Eliminating the chemical side effects and tailoring the mechanical activations to not include brain-regions involved in the mental side effects of psychedelic states could increase the efficacy of these methods. Unfortunately, substances initially developed for the sake of science and therapy has continually been met with illicit use. The frightening epidemic of oxycodone use is but one example of substance abuse that stems from pharmaceutical development. Therefore, the development of new technologies that could theoretically be used to alleviate pain, suppress consciousness, and other elicit other unforeseen effects should be treated with caution in order to avoid maladaptive practices. For example, at-home tDCS devices such as the Foc.us (http://www.foc.us/) have been reported to enhance the cognitive abilities of gamers. However, the long-term side effects of tDCS and its non-focal nature make it potentially dangerous and addictive. For, if a gamer sees improvements in their gameplay, then what is to stop them from increasing the voltage? Better yet, what incentive is there for them to ever stop using the device? This begs to ask the question: does the creation of publically available neuromodulation devices that can induce psychedelic states just create an easier way for people to become dependent on such systems? Technically, the answer to the last question is “yes”. Just as the availability of a new substance creates an unlimited potential for its use, the introduction of a technology that could alter minds is equally likely to be recruited. However, humans have a seemingly insatiable and uncontrollable appetite for consciousness exploration as seen by the extensive history of trepanning and ayahuasca brews. Thereby it seems as though the development of such proposed neuromodulatory technologies is inevitable and its use most likely rampant. Thus, the legal ramifications that surround the use of such devices should be relatively lax, especially in light of the recent results of Portugal’s decision to decriminalize all drugs. Portugal’s drug use, crime rate, and national sickness decreased substantially after it’s nationwide decriminalization of drugs: “The data show that, judged by virtually every metric, the Portuguese decriminalization framework has been a resounding success” (Greenwald, 2009). Thereby, it seems as though the true problem with drug-use is legislation. Seeing as drug-use is concerned with perturbations of consciousness, it should follow then that the true problem with altered states of consciousness is legislation. Consequently, legislation should be put in place that exerts little to no regulations on the use of this hypothetical technology for consciousness exploration. Furthermore, it should be considered unethical for legislatures to ban “states of consciousness”, since, with this technology, there would be no possibility for “possession” charges other than the possession of the device (which could easily be skirted around in the same way that “bongs” are sold for tobacco use only). Thus, preventing the use of this technology would be akin to a direct ban on states of consciousness, which seems highly unethical. For, are we not free to modulate ourselves as we see fit? It would appear that in the physical domain, there are no daunting restrictions. For example, body-builders routinely use weights to alter their physical appearance; chiropractors use electricity to increase muscle tone in their patients; plastic surgeons essentially rely on physical modifications. A society that regulates mental explorations that have absolutely no effect on the well being of the population at large should be considered dystopian. Unfortunately, current legislature in the majority of the world regulates the possession of illicit substances with penalties as severe as death. Regulations concerning the possession and use of substances that are conducive to violence (e.g bath salts) have a utilitarian benefit in their restrictions and are justified. However, such penalties seem outlandish for drugs that affect only the user. The proposed technologies should be governed under a legislation that finds a balance between allowing the safest possible administration of consciousness alterations while preventing the creation of states of consciousness that promote violence. Governments should even go so far as to encourage the use of technologies that act as safe alternatives to users that currently rely on physical chemicals. Such encouragement would be an inspiring extension on Portugal’s needle exchange program, which reduced the nation’s rate of infection, AIDS, and more. In summation, it would appear as though there is feasibility for a technology that can mimic the conscious states experienced by those who use psychedelic substances. Such possibility is created by a small leap of theory that draws from recent advances in neuroimaging (e.g fMRI) and neuromodulation devices (e.g LIFUP). As a result, users can achieve the desired inspirational effects of psychedelics and simultaneously remove a majority of the potential for chemical induced harm. Such affects can aid scientific discoveries, decrease crime, and increase health. Lastly, the legislature of such technologies should be treated with relative leniency so as to optimize the utilitarian outcomes of this beneficial technology. Barker, S., Borjigin, J., Lomnicka, I., and Strassman, R. (2013). LC/MS/MS analysis of the endogenous dimethyltryptamine hallucinogens, their precursors, and major metabolites in rat pineal gland microdialysate. Biomedical Chromatography 27, 16901700. Bullmore, E., and Sporns, O. (2009). Complex brain networks: graph theoretical analysis of structural and functional systems. Nature reviews. Neuroscience 10, 186–98. Bystritsky, A., Korb, A., Douglas, P., Cohen, M., Melega, W., Mulgaonkar, A., DeSalles, A., Min, B.-K., and Yoo, S.-S. (2011). A review of low-intensity focused ultrasound pulsation. Brain stimulation 4, 125–36. Carhart-Harris, R., Erritzoe, D., Williams, T., Stone, J., Reed, L., Colasanti, A., Tyacke, R., Leech, R., Malizia, A., Murphy, K., et al. (2012a). Neural correlates of the psychedelic state as determined by fMRI studies with psilocybin. Proceedings of the National Academy of Sciences of the United States of America 109, 2138–43. Carhart-Harris, R., Leech, R., Williams, T., Erritzoe, D., Abbasi, N., Bargiotas, T., Hobden, P., Sharp, D., Evans, J., Feilding, A., et al. (2012b). Implications for psychedelic-assisted psychotherapy: functional magnetic resonance imaging study with psilocybin. The British journal of psychiatry : the journal of mental science 200, 238–44. FRANZEN, F., and Gross, H. (1965). Tryptamine, N,N-Dimethyltryptamine, N,N-Dimethyl-5-hydroxytryptamine and 5-Methoxytryptamine in Human Blood and Urine. Nature 206, 1052–1052. Geffen, L. B., et al. “Release of dopamine from dendrites in rat substantia nigra.” (1976): Nature 258-260. Horovitz, S., Fukunaga, M., Zwart, J., Gelderen, P., Fulton, S., Balkin, T., and Duyn, J. (2008). Low frequency BOLD fluctuations during resting wakefulness and light sleep: A simultaneous EEG‐fMRI study . Human Brain Mapping 29, 671–682. Lazar, S. W., Bush, G., Gollub, R. L., Fricchione, G. L., Khalsa, G., and Benson, H. (2000). Functional brain mapping of the relaxation response and meditation. Neuroreport 11, 1581–5. Levasseur-Moreau, J., Brunelin, J., and Fecteau, S. (2013). Non-invasive brain stimulation can induce paradoxical facilitation. Are these neuroenhancements transferable and meaningful to security services? Frontiers in human neuroscience 7, 449. Loo, C., and Mitchell, P. (2005). A review of the efficacy of transcranial magnetic stimulation (TMS) treatment for depression, and current and future strategies to optimize efficacy. Journal of Affective Disorders 88, 255267. Miller, E., and Cohen, J. (2001). An integrative theory of prefrontal cortex function. Annual review of neuroscience 24, 167–202. Nichols, D. (2004). Hallucinogens. Pharmacology & Therapeutics 101, 131181. Pascual-Leone, A., Walsh, V., and Rothwell, J. (2000). Transcranial magnetic stimulation in cognitive neuroscience–virtual lesion, chronometry, and functional connectivity. Current opinion in neurobiology 10, 232–7. Peres, J., Moreira-Almeida, A., Caixeta, L., Leao, F., and Newberg, A. (2012). Neuroimaging during trance state: a contribution to the study of dissociation. PloS one 7, e49360. Rees, Alun. “Nobel Prize genius Crick was high on LSD.” Mayan Majix – Articles – Nobel Prize genius Crick was high on LSD. N.p., 8 Aug. 2004. Web. 12 June 2014. <http://www.mayanmajix.com/art1699.html&gt;. Richards, William, et al. “LSD-assisted psychotherapy and the human encounter with death.” Journal of Transpersonal Psychology (1972). Rocca, J., 2003, Galen on the Brain, Leyden: Brill. Short, E., Kose, S., Mu, Q., Borckardt, J., Newberg, A., George, M., and Kozel, F. (2010). Regional brain activation during meditation shows time and practice effects: an exploratory FMRI study. Evidence-based complementary and alternative medicine : eCAM 7, 121–7. SPORNS, O., CHIALVO, D., KAISER, M., and HILGETAG, C. (2004). Organization, development and function of complex brain networks. Trends in Cognitive Sciences 8, 418425. Squire, L. (1992). Memory and the hippocampus: a synthesis from findings with rats, monkeys, and humans. Psychological review 99, 195–231. Strassman, R., Qualls, C., Uhlenhuth, E., and Kellner, R. (1994). Dose-response study of N,N-dimethyltryptamine in humans. II. Subjective effects and preliminary results of a new rating scale. Archives of general psychiatry 51, 98–108. Yantis, S., Schwarzbach, J., Serences, J., Carlson, R., Steinmetz, M., Pekar, J., and Courtney, S. (2002). Transient neural activity in human parietal cortex during spatial attention shifts. Nature Neuroscience 5, 9951002. Very proud of my research assistants(first and second authors) putting this one together! Although the hippocampus is well known to contribute to the storage and retrieval of long-term memories, emerging data suggests that the hippocampus may also contribute to the online maintenance of task-relevant representations in some tests of working memory. To the degree that hippocampal mechanisms serve to facilitate performance on short delay memory tasks, individual differences in hippocampal microstructure could contribute to across-subject variance in working memory performance. To examine the relationship between hippocampal structure and function, we obtained the diffusion-weighted images (DWI) of a large cohort of subjects from the Human Connectome Project MRI dataset. We used the DWI to compute diffusion tensor images (DTI), which in turn were used to generate whole-brain mean-diffusivity (MD) maps. MD in deep gray matter has been construed as an indirect measurement of local microstructural deficits (Kim et al., 2013). Thereby, we aimed to assess the underlying integrity of each subject’s hippocampal gray matter and use examine whether these measures can account for variance in memory performance across subjects. Hippocampal regions of interest (ROIs) were identified using Freesurfer’s automated segmentation algorithm. Average MD within the left hippocampus was found to be significantly correlated with performance on a Working Memory List Sorting Task. This result is consistent with prior work showing that hippocampal MD serves a predictor for verbal and visuospatial memory (Carlesimo et al., 2010). This current study extends these previous findings and contributes to the debate surrounding the role of the hippocampus in working memory. We plan to conduct further analyses aimed at characterizing the potentially important role of fronto-hippocampal connectivity in working memory performance. + These authors contributed equally to this effort. Kim, Hengjun J., et al. “Alterations of mean diffusivity in brain white matter and deep gray matter in Parkinson’s disease.” Neuroscience letters 550 (2013): 64-68. Carlesimo, Giovanni A., et al. “Hippocampal mean diffusivity and memory in healthy elderly individuals: A cross-sectional study.” Neurology 74.3 (2010): 194-200.